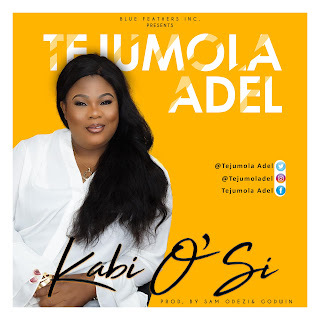 ​Nigerian-US Gospel music minister, Tejumola Adel makes profound debut with an uplifting sound of praise declared in “Ka Bi O si”. Having been a long time music maestro, she temps her cords to this string single as a recap in recognition of God's supremacy as the King of kings who sits on His throne and rules in the affairs of men. Having more to come, the Warri indigene and retired bank manager surfaces the praise tune to begin with. Ka Bi O si redones God's majestic reigns over the affairs of the universe, get it sure and jubulate in the Holy Ghost! Tejumola Adel was born in Warri, but grew up in Ibadan, Oyo state Nigeria. She is a songwriter, a gospel artiste and also features as an event planner. She Attended Sacred Health private primary school and proceeded to St. Teresa's College Ibadan for both Elementary and High college respectively.